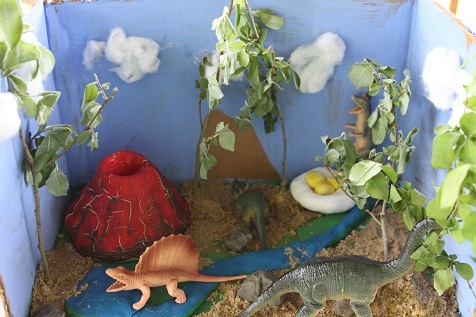 Poppins Book Nook- Dinosaur Fun! I am so excited to be a part of the Poppins Book Nook! This is our first month joining in the fun. 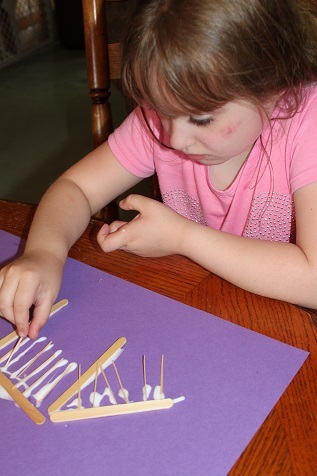 Each month a different theme is picked and then everyone picks a book that relates to the theme and then creates some activities to go along with the book. 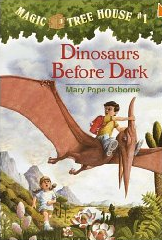 We picked “Dinosaurs Before Dark” by Mary Pope Osborne for our book. Hailey has just recently started reading chapter books, so she has been really excited that she can read these books on her own. If you haven’t read this book before- it’s a series about a brother and sister, Jack and Annie. This is the first book in the series where Jack and Annie discover a tree house. There are lots of books in the tree house and when Jack is looking at one about dinosaurs he wishes that he could see a real pteranodon. 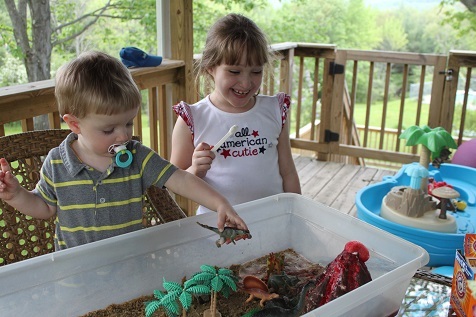 Suddenly Jack and Annie end up in the days of dinosaurs and of course, an adventure begins. I love the Magic Tree House series- they are fun, fictional stories but with lots of opportunities for learning about history added in. A shoebox just wasn’t going to cut it for our plans so we used a regular box instead. 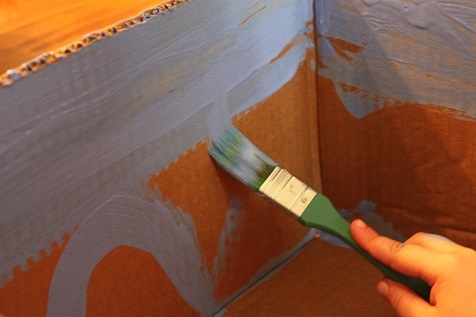 Hailey got to work painting her box. She added lots of different props. 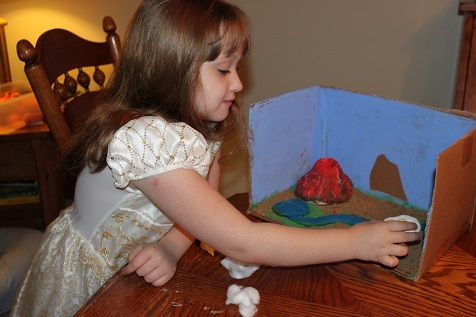 She put a stream and a little pond in, painted some grass on, added some cotton clouds, put some sand and trees in. And of course, the dinosaurs. 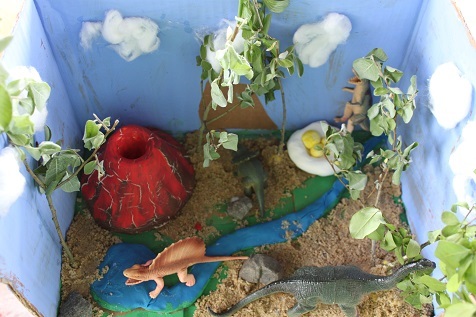 Hailey’s completed diorama- she did a great job! 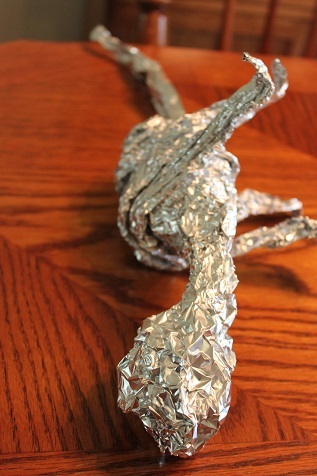 First the dinosaur was formed using aluminum foil. There is newspaper stuffed inside his head and body to help keep its shape. 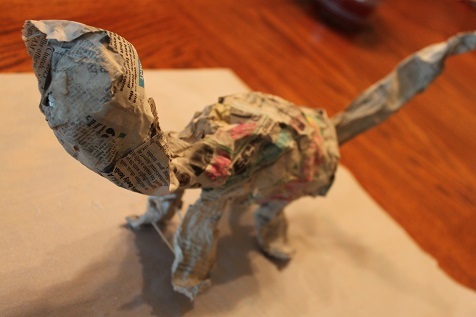 The dinosaur all covered in paper mache. For paper mache, we use a 2:1 ratio of water to flour, and I added a little white glue to the mixture too. It takes a couple of days to be completely dry. Once the dinosaur was dry it was time to paint him. We did a little research about the color of dinosaurs- some scientists believe that dinosaurs were gray, dark green, brown, etc. so that they could blend in with their surroundings. 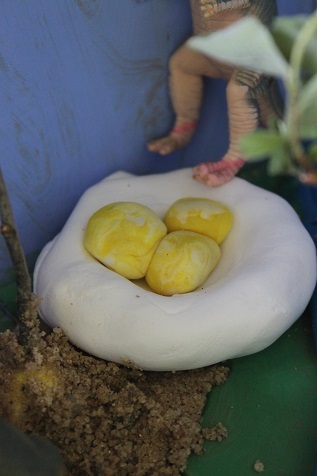 Other scientists believe that dinosaurs were colorful and even had pretty, bright spots in order to attract a mate. 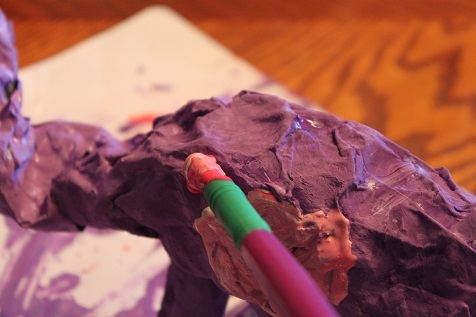 Hailey decided she agrees with the scientists who think the dinosaurs were colorful, so she painted him purple. She added some pink and blue spots. 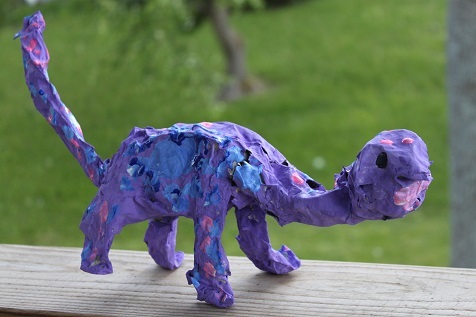 The completed paper mache dinosaur. 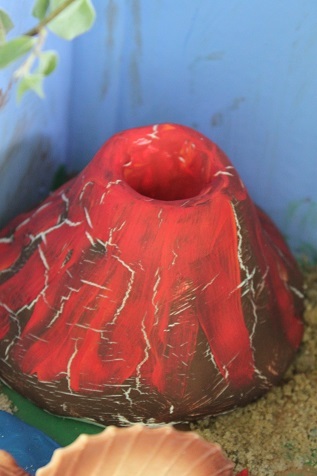 We learned a lot about volcanos too. I cut out some dinosaur footprints and wrote some volcano related vocabulary words on them (lava, eruption, magma, crust, mantle, outer core, inner core, pumice, tuff, and pahoehoe). 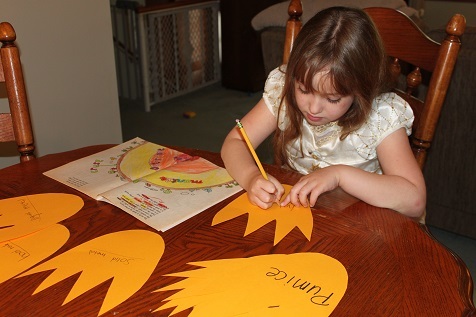 Hailey wrote the definitions on the backs of the footprints. Then she spread them around the living room. 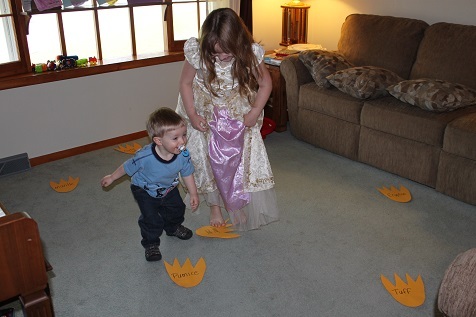 I made some noises and Hailey and Hunter danced around on the footprints. When I stopped making the noise, Hailey read the definition of the word. 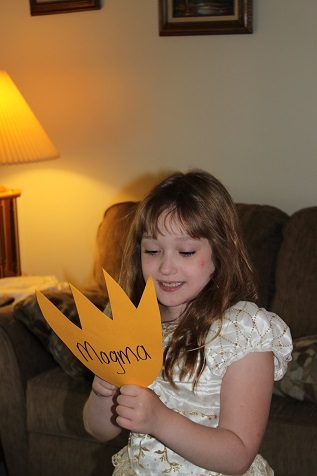 The goal, of course, being that once we play it enough she will remember the definitions. 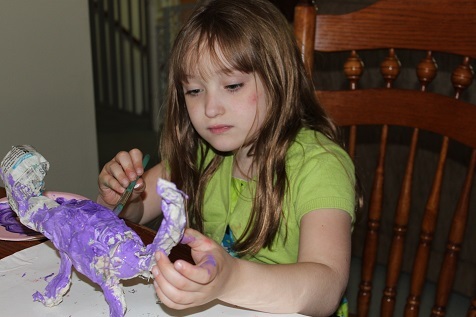 Hailey made some dinosaur bones. She created a dinosaur fossil. 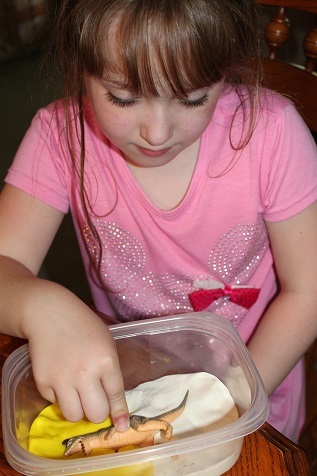 One of her favorite activities was setting off a volcano she made. 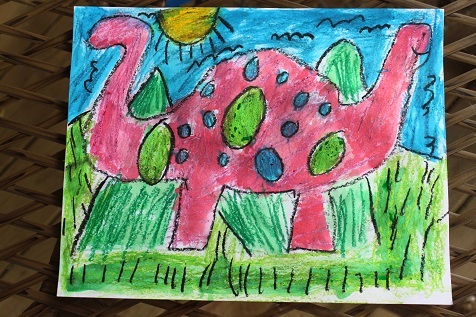 She made this pretty dinosaur oil pastel painting. What’s in Abraham Lincoln’s Hat? 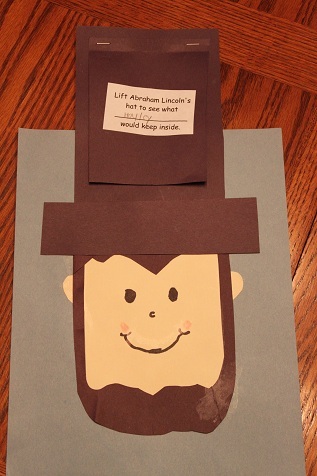 Since president’s day is coming up Hailey has been learning about Abraham Lincoln. 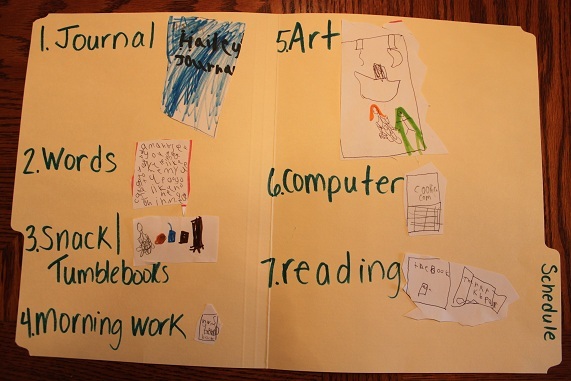 She made a book about Abraham Lincoln- she colored it, read it and answered questions at the end of it. We read a lot of information about Abraham Lincoln and talked quite a bit about him. Hailey wanted to know how many people were killed during the civil war, so we ended up on this Civil War Facts site learning more about the Civil War. 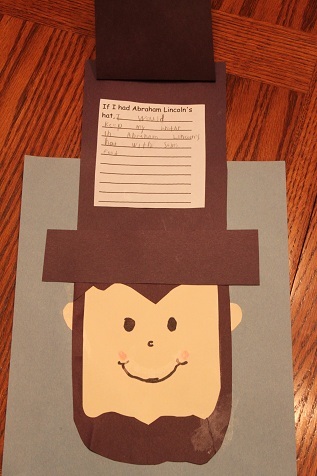 We both really enjoyed learning about Abraham Lincoln. Did you know that he used to keep things inside of his hat? I just learned that this week I saw this cute craftivity at A Cupcake for the Teacher and knew we had to do it. I just found her site a couple of weeks ago and I love her ideas!! Last week for science I told Hailey she could pick anything she wanted to learn about. 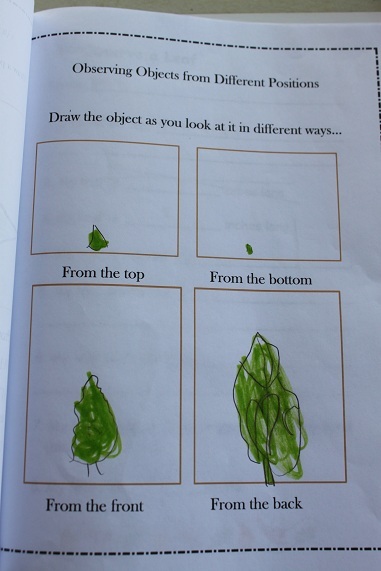 I gave her this worksheet I found and she went outside to find something to pick for science. She decided to pick a leaf. 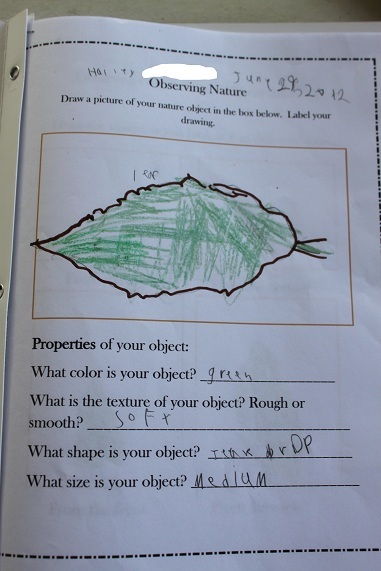 Hailey filled out this Observing Nature worksheet about her leaf. Page 2 of the worksheet. 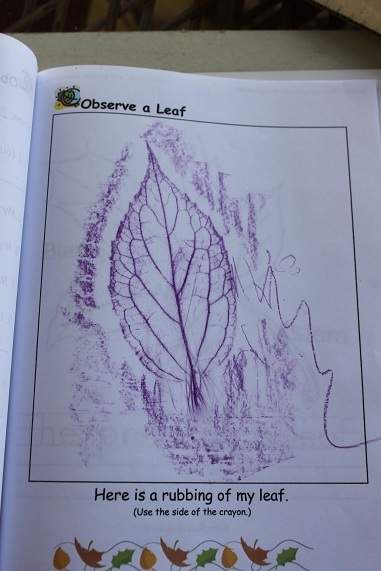 We also had an Observe a Leaf worksheet which Hailey filled out and then did a leaf rubbing. 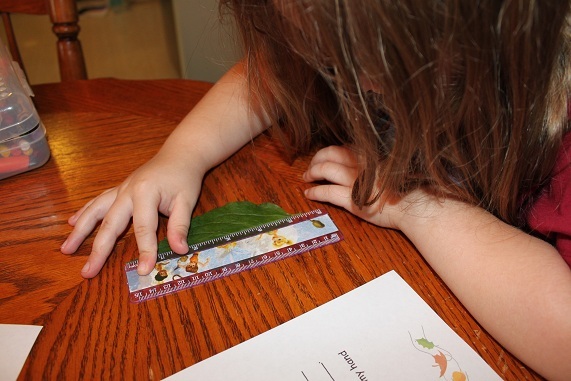 Hailey had to answer several questions about her leaf, including how many inches long it was. We also talked about the different parts of a leaf and started a science journal so she can keep track of what she does this summer for science. Summer vacation has officially started and Hailey has plans of keeping busy by doing school work all summer. So, to keep her busy and happy I have made some plans for this summer. Today was our first day- and while she wants to work all day long, I told her we would do school work in the morning and she would spend the afternoon playing and relaxing. 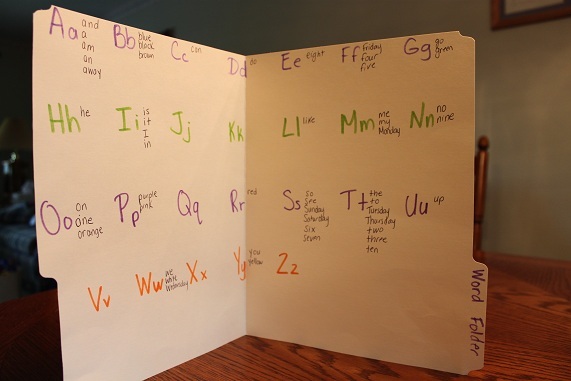 Since I do not have a place to put a word wall, we made a word folder. We have sight words, color words, number words and days of the week in here. We’ll be adding more sight words throughout the summer. We also made a schedule today of what we will do each morning. For art time Hailey drew pictures to go with our schedule. For the most part I will just be posting the different art activities that we do. Since Hailey is home and I actually have someone to do crafts with hopefully I’ll be posting more than once a week!